Cycling Pulse has partnered with leading virtual reality cycling platform Zwift on a series of social video content comparing the iconic climb, Alpe d’Huez, with the virtual version on Zwift. 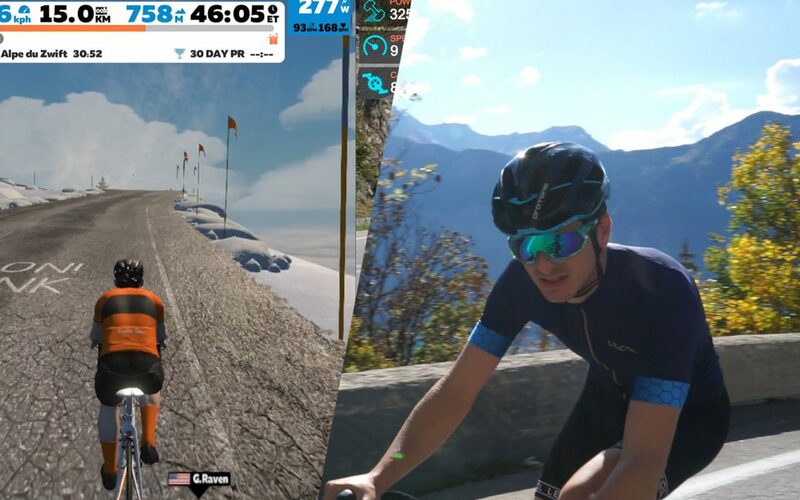 As part of Cycling Pulse’s ongoing ‘Zwift Vs Real Life’ series, where the Cycling Pulse team explores how well Zwift’s virtual iteration of well known climbs, such as Box Hill, compares to the real thing, Cycling Pulse teamed up with Zwift to take things up a notch. Following the release of the Alpe du Zwift on Zwift earlier in the year Cycling Pulse was determined to find out how realistic the virtual climb was compared to its real life counterpart, the iconic Alpe d’Huez. There was only one thing for it: to head out to the French Alps and put it to the test. The challenge presented the team with the opportunity to explore how cyclists can use indoor training to prepare for Alpine climbs, with Zwift being the perfect training tool to get you there. In partnership with Zwift, an idea for a series of three videos was conceived. The first video would focus on Cycling Pulse’s training and preparation for the challenge. Using Zwift as our training tool, we had four weeks of intensive training to prepare for the climb. With expert advice from a cycling coach, the video explores the type of training that can be undertaken on Zwift to prepare for long climbs. Can you train for Alpine climbs indoors? Join us as we embark on a four-week challenge to find out! The second video was an innovative livestream to encourage audience participation and engagement in the project. Over 300 cyclists from across the world joined Cycling Pulse on a race up the Alpe du Zwift, broadcast live from Zwift’s London HQ and livestreamed on the Cycling Pulse Facebook page. Cycling Pulse was joined by special guest, Olympic gold medallist and former professional cyclist, Dani Rowe MBE, during the livestream to take questions from viewers during the race to the top of the climb. In addition, cycling coach, Matt Rowe, from Rowe & King was on hand to answer training related questions from the audience. The third and final video was the main event as Cycling Pulse pitted the virtual climb against the real thing. With a side by side comparison of key features of the climb, such as ‘Dutch Corner’, corner 7 on the famous climb where hordes of Dutch fans gather each time the Tour de France winds its way up Alpe d’Huez, the video aimed to see how well Zwift had done replicating the real life climb on their virtual platform. Published on Cycling Pulse’s Facebook page (360,000 followers) and YouTube channel (16,000 subscribers) with additional behind the scenes coverage on Cycling Pulse’s Instagram page (115,000 followers), the series of content generated excellent levels of audience interaction and views, helping cyclists from across the world engage with Zwift and the concept of indoor training in an informative and entertaining manner. Cycling Pulse is the cycling publisher for the social generation. Our aim is to bring fun, entertaining cycling content to cycling fans across the world and put our growing community of cycling lovers at the heart of the action! Follow us on Facebook, Instagram and make sure you’re subscribed to us on YouTube.